1. Preheat the oven to 200ºC, gas mark 6. Place the cod on a small baking tray, season and bake for 15 minutes or until just cooked through. 2. Meanwhile, heat the oil in a frying pan and fry the pak choi cut-side down for 2-3 minutes. Turn the pak choi over, add the soy, hoisin and 3 tbsp water then cover and simmer for 1-2 minutes. 3. 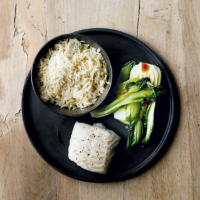 Heat the rice according to the pack instructions and serve with the Chinese pak choi and the baked cod.